1. Preheat the oven to 200°C, gas mark 6. Lightly oil a 22cm round or square cake tin. 2. Place the polenta, flour, baking powder, chilli flakes (if using) and a pinch of salt in a bowl. In a large jug, mix together the yogurt, milk, butter and eggs. Pour this over the flour mixture, then stir in the cheese, salad onions and sweetcorn, mixing well until you have a very thick batter consistency. Pour the mixture into the cake tin and bake for 45 minutes until golden and firm to the touch, and when a skewer inserted into the middle comes out clean. 3. 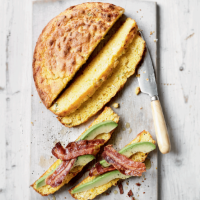 Serve the corn bread warm with wedges of avocado and crispy grilled bacon.